Neah Bay and Cape Flattery were only 19 mile west of us. 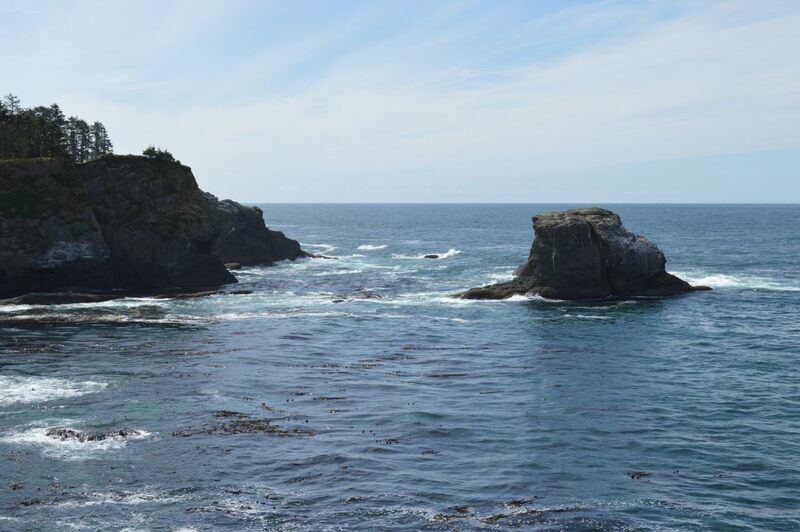 That is the most northwestern tip of the USA Continent.It is an experience to drive the 20 miles in about 35 to 40 minutes. The road is paved, but there are switchback curves to deal with. We were glad that we chose to park in Clallam Bay rather than driving the rig up the mountain. Our first stop was Cape Flattery. We decided to take the short 3/4 or 1/2 mile hike down to the sea first, while we had the energy. It is a beautiful walk through deep rain forest terrain. They have some pathways decked with a few handrails. Walking sticks are placed at the trail head to borrow or purchase. We had our own walking sticks (that Phil made) and we were glad for them. The easy trail section, downhill! It was a careful walk back up the mountain. We were encouraged by hikers returning from the cape that the hike was well worth the effort and it was an effort on the uphill return trip. side and we were so excited when we discovered a pod of 3 whales feeding in the kelp beds! We stayed for a long time, until the whales meandered off out into the sea in search of another feeding spot. They were so close to us! We felt so blessed to experience these mammals from the sea. We returned to Neah Bay and visited the Makah Indian Cultural Center. Cameras were not allowed, but it is an interesting and informative facility. It had displays of various canoes for fishing and different ones for whaling, a long house that demonstrated the living quarters for family groups and an educational film on the Makah tribe. The museum was designed and constructed to display the objects from the Ozette archaeological site near by. The site has been filled in and vegetated, but the photographs and displays gave insight to a sophisticated society. The site discovery was beneficial to the the Makah tribe in learning more about their history and supporting their claim to fishing rights and fishing tools that they could use according to their culture. We ended our day trip with lunch/dinner at the Warm House. This is still a quiet fishing village and joy to visit. Thank you Deb for being so loyal. 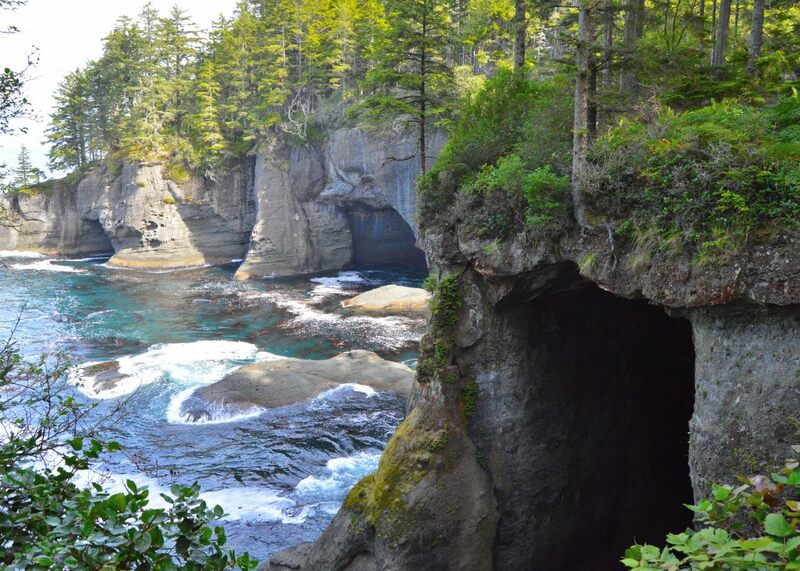 Yes, we loved the Neah Bay and Cape Flattery. You are right, we chose not to attempt the trek to the Ozette site. I could not find information on the Hoko Rivier site when in Sekiu. We were only in Sekiu a couple of afternoons. We found the history so interesting and the local’s pride very impressive. It was a really cool place to roam around. Phil really liked watching the fishing boats come and go. We did make it to Hurricane Ridge and I have a blog ready to post once Phil proofs it. That was a wonderful day. We did not get to any of the other areas there due to road blocks and repairs. Several areas were shut down a little earlier than usual due to the repairs from rock slides and wear and tear.